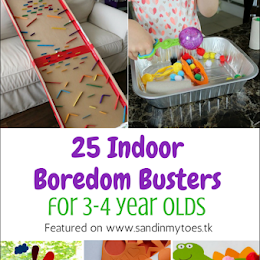 Most kids love animal crafts, and they are fun to make too! 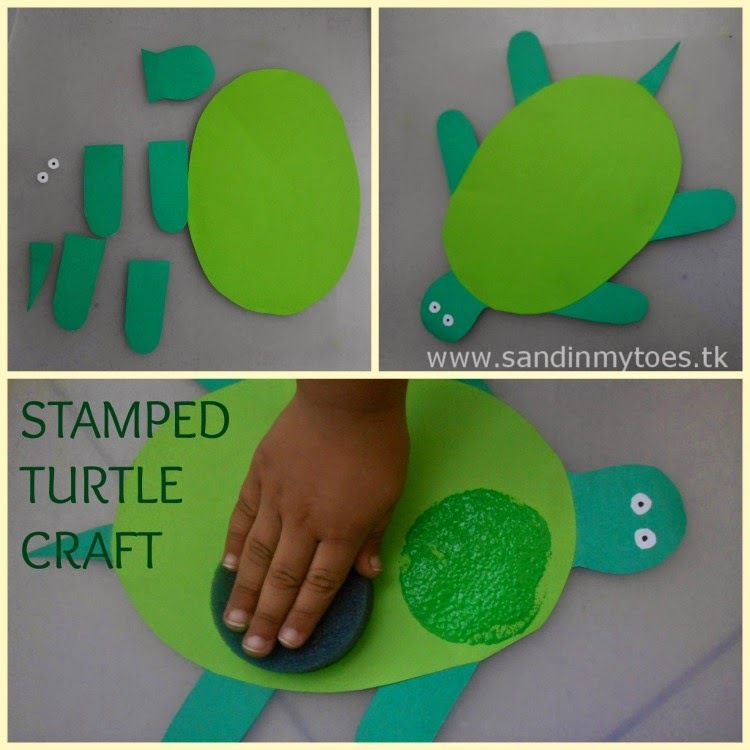 Our latest is this simple turtle craft in which we used a sponge stamp to paint with. 1. Cut out a large oval shape with the lighter shade of green for the shell. 2. 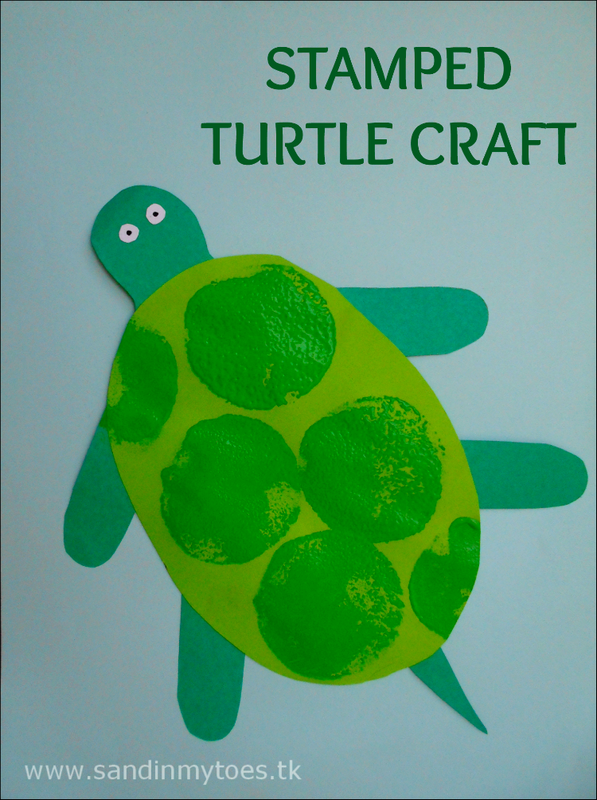 Cut out the flippers of the turtle, a head, and tail with the darker green paper. 3. Stick on the different parts of the turtle in the right places (as shown below) and stick on the eyes too. 4. Use the stamp to make patterns on the shell with green paint. We used a circle sponge stamp, but if you have a hexagon/pentagon shape, that would look great too. 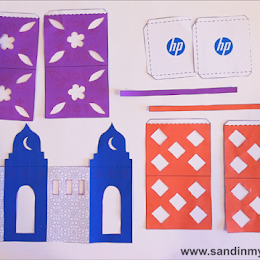 This craft is really easy to do, and can even be done as a group activity on a play date or in the classroom. It would also make a great addition to an underwater study unit for toddlers and preschoolers. Last time I gave Mr 2 some potatoes to stamp with, he was ONLY interested in painting the potatoes ;-) ...We'll have to try again. That turtle is so cute. Lovely creative stamping. That looks so effective, and yet is so simple. Looks cute! I love simple crafts like this one. Super cute! He must have had fun then! 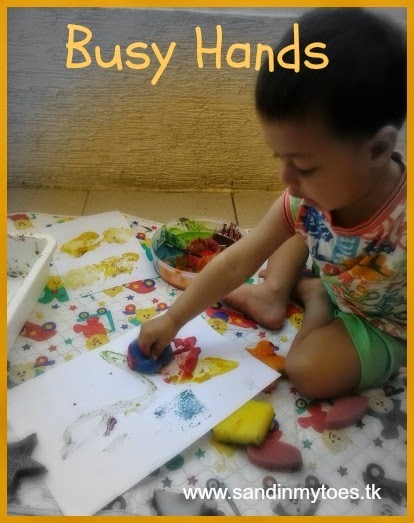 This is so simple but so effective, an ideal craft for afternoons after nursery. Like that these are simple and don't need too many materials. The turtles look really cute.